‘Bless Your Heart’™ rabbiteye blueberry - Vaccinium ashei 'Alapaha' PP16266 – is the perfect addition for anyone who loves blueberries. 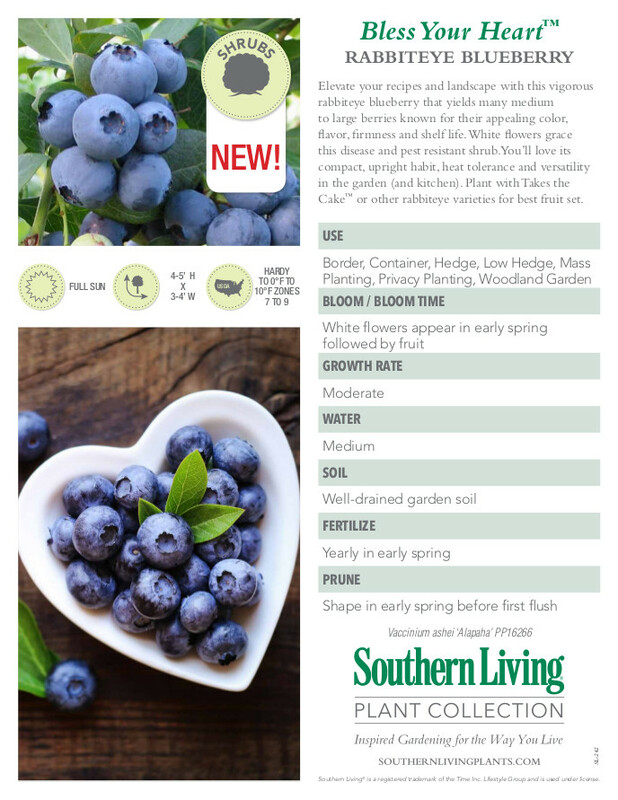 Small white flowers flourish in the early spring, leading to the development of medium to large sized blueberries bursting with flavor. These berries are sought after for their firmness, shelf life, and dark blue color. With its drought tolerance and disease and pest resistance, this shrub is a must-have. Plant ‘Bless Your Heart’™ rabbiteye blueberry in well-drained, acidic soil. Amendment may be necessary to achieve the desired pH. Prune in the fall after fruit harvest. To establish a hedge of ‘Bless Your Heart’™ rabbiteye blueberry, plant 3 to 4 feet apart center-to- center. Plant this shrub at least 5 feet apart on center for foundational plantings.